As he proceeded through the course there occurred a critical change in his prime scientific interest from chemistry to botany and the emerging field of plant physiology. His honours project was on the mechanism controlling the opening and closing of stomata, the pores on the surface of leaves that regulate the exchange of gases such as carbon dioxide and oxygen into and from leaves. He graduated with First-Class Honours in 1934. With the aid of a University of Sydney research scholarship and then a Macleay Fellowship from the Linnaean Society of New South Wales, he continued working in Sydney on the stomatal opening problem for the next two years. In 1936, he was awarded a prestigious Science Research Scholarship of the Royal Commission for the Exhibition of 1851. This was awarded to promising students from the Dominions to study in Britain. Professor AHK Petrie of Adelaide advised Bob that if he wanted to pursue a career as a physiologist then he should try to work with Professor GE Briggs in the Botany School at Cambridge. The primary aim of this research was to explain how the energy necessary to drive the active uptake of ions against a concentration gradient was made available from the process of respiration. In the latter part of 1938, the newly appointed Professor, Eric Ashby, offered Bob an Assistant Lecturer position in the Botany School at the University of Sydney. This set a deadline for completing his research at Cambridge and submitting a thesis. The mandatory oral examination was completed just before he sailed for Australia and news that his doctorate had been granted was received by radiogram as the boat approached Capetown. Bob’s intention was to continue his work on ion uptake in plant cells in Sydney but the Second World War intervened. The head of the Botany School, Professor Ashby, became involved in war-related matters that often took him away from the department. As a result, Bob took over some of Ashby’s administrative duties, a great experience for what was to come. He also served as the liaison officer between the University of Sydney and the Ministry of Post-War Reconstruction, and as secretary to the Vice-Chancellor’s Research Committee. Academics generally switched their research to aspects related in some way to the war effort. In what free time he had left, Bob devoted himself to two problems related to the storage and shipping of food. One was to develop procedures to prolong the storage life of apples and other fruit. The other was related to the open-air storage of the huge reserves of wheat in Australia. The problem was to determine why the wheat, stored in such large quantities, was getting hot. As Bob suspected, the generation of heat was not due to the respiration of the grain itself, which was very low, but rather, to the respiration of the insects infesting the wheat. Later, he was appointed head of the Plant Physiology Unit created within the Botany School, Sydney University and run jointly with that School, to study the physiology of plants including, of course, fruit and vegetables. This Plant Physiology Unit was set up in 1950. There followed, through the decade of the 1950s, a remarkably productive period of research activity in the Plant Physiology Unit. Many of the students passing through during this time were to go on to significant independent careers. Bob’s own work on ion transport, and especially the link with mitochondrial respiration, progressed substantially. He was also remembered for the pace at which he strode about the corridors of the Unit constrained only by his polio-induced limp, for his amazing Ford Prefect car which just managed to reach the city speed limit in top gear, and for his availability as adviser and counsellor. In late 1958, Bob accepted a visiting professorship at the University of California, Los Angeles. By this time he was numbered amongst the leaders in both research and speculation relating to the energetics of ion transport and accumulation in plant cells. His views were outlined in two important review articles and in a book Electrolytes in Plants co-authored with GE Briggs and AB Hope that appeared between 1957 and 1960. By this time his contributions to understanding the mechanism and energetics of active ion uptake were being widely recognised. He was elected a Fellow of the Australian Academy of Science in 1954, a Fellow of the Royal Society of London in 1961 and a Foreign Associate of the United States National Academy of Sciences in 1962. A full account of the life and achievements of Bob Robertson can be found by following the link in the Sources below. At that time CSIRO had a staff of more than 4 000. Research interests ranged from the most applied aspects of agriculture and secondary industry to the most esoteric basic research including astronomy. Bob saw the role of the Executive as being to serve the interests of the scientists at the coalface. But of course the Executive still had to deal with the Chiefs of Divisions, with politicians and with various outside bodies, and had the final say in the general direction of research and the allocation of funds. Early in 1960, the University of Adelaide advertised the Chair of Botany rendered vacant by the death of Professor JG Wood. The Department was founded in 1912 and had had only two previous Professors, TGB Osborn and JG Wood. Bob was invited to fill the chair with the understanding that, to complete his obligation to CSIRO as an Executive member, he would not take up the position until February 1962. He held the position with great distinction from 1962 to 1969. He continued his research on ion transport but also developed other areas. He expanded the Department’s reputation in the physiology of ion transport by the appointment of Michael Pitman, introduced metabolic biochemistry with the appointment of Joe Wiskich, and established ecophysiology with the appointment of Russell Sinclair. He also took a keen interest in the physiology of arid zone vegetation using the reserve on Koonamore station between Yunta and Lake Frome, established in 1925 by Osborn. In the latter part of his period in Adelaide, Bob wrote an important review and his widely acclaimed book, Protons, Electrons, Phosphorylation and Active Transport. In his notes and records Bob draws attention to the distraction from research occasioned by the various committee activities that took him to Canberra so frequently. His students and colleagues, however, remember the extent to which he was able to keep his hand in research at the same time as he was building opportunities for others. These burgeoning national committee responsibilities made it sensible to consider a permanent move to Canberra. He resigned from the Chair of Botany at Adelaide on 9 August 1969 and moved to Canberra to become Master of University House, the original Faculty and graduate student ‘college’ at the Australian National University (ANU). This position went along with provision of laboratory space at the Research School of Biological Sciences (RSBS) and some research support. He was especially attracted by the opportunity for some uninterrupted research. University House had by then served its function in support of the nation’s embryonic premier research university. As the second Master, he had to guide the transformation of the House into a financially self-sustaining entity and hospitality centre on campus, while retaining its collegial character. While moving the House in this direction, he became even more heavily involved in national scientific affairs, first as President of the AAS (1970-74) and later as second Director of the RSBS. He remained in Canberra until retirement in 1978. His career reached its greatest heights as second Director of the RSBS at the ANU. He took up the appointment in January 1973, a few months after the School moved into its new building, and retired in 1978. By then RSBS was an impressive institution moving from its foundation in 1967 under David Catcheside with 46 staff to an establishment with 290 staff on its tenth anniversary in 1977. His unit listed twelve projects in 1977, many involving collaborations with other groups, and he co-authored an important paper with NK Boardman on the link between charge separation, proton movement and ATPase reactions; a considerable achievement in austerity years when funding cuts consigned his carefully prepared plans for a Department of Membrane Biology, foreshadowed in his first Annual Report (1973), to the scrap heap. Bob’s links to the ANU continued throughout his retirement. He served as Pro-Chancellor (1984-86) and made a point of commuting from his retirement home in Binalong to participate in the ANU-sponsored Robertson Symposia, named in his honour and held in RSBS. Bob Robertson was primarily responsible for setting up a number of structures and institutions critical to the future of Australian science. He was secretary of the Australian National Research Council (ANRC) in 1952, when steps were taken to review the problems of Australian universities that in due course led to the formation of the Murray Committee and the subsequent transformation of the Australian university scene. He also played an important role in negotiations that led the ANRC to make way for the foundation of the Australian Academy of Science (AAS) in 1954. 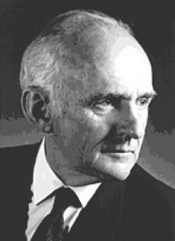 He was associated with the founding of the Australian Society of Plant Physiologists in 1958 and while Professor of Botany in the University of Adelaide, played a key role in the development of the research capacity in Australia’s university sector at a time when it was expanding most rapidly. His most enduring role was in the creation of the Australian Research Grants Committee (ARGC) that survives today as the Australian Research Council. He was involved in discussions with the Victorian and South Australian Departments of Education about updating the school biology syllabus and textbooks. The resulting book, The Web of Life, went through three editions between 1967 and 1981 and sold over a million copies. This set the precedent for AAS-sponsored textbooks in chemistry, mathematics, geology and environmental science. He revived a Standing Committee on National Parks and Conservation, and nurtured relationships with the other Australian Academies to develop major interdisciplinary environmental conservation projects involving the Murray River basin and, later, the Botany Bay Project. During this period he was also joint leader of the delegation that initiated scientific exchanges with the People’s Republic of China after the Cultural Revolution, a member of the Science Advisory Committee for the Australian Broadcasting Commission (1972-74) and a member of the first interim Advisory Committee for Science and Technology, set up in 1972 by the then Liberal Government. Changes of government saw such interim committees come and go and it was several years before its descendant, the Australian Science and Technology Council (ASTEC) was formally incorporated. As AAS President, Bob also solicited government support for a comprehensive survey of Australia’s biological resources. Various interim bodies directed to this cause finally led to the official establishment of the government-funded Australian Biological Resources Study in 1978. Throughout a remarkably busy and very influential life in science, he gained a reputation for his willingness to ‘go the extra mile’, for his fair-mindedness, his generosity, and his concern for friends and colleagues in all walks of life. He was equally at ease with Prime Ministers and just-hired laboratory assistants or cleaners. He had a personality and management style not common amongst those who took on the responsibilities and undertakings that he did. Sir Rutherford Ness (Bob) Robertson was one of Australia’s most distinguished, influential and respected scientists. He was eminent both for his contributions to scientific thought and knowledge and for the remarkable range of activities he undertook in the cause of science. His contributions to our understanding of the bioenergetics of inorganic ion transport in plant cells were widely recognised. In his other life he served in a number of key administrative-managerial positions, was the prime mover in a variety of major initiatives that had critical and lasting impacts on the development of Australian science and was a trusted friend and adviser to a generation of younger plant scientists. The Research School of Biological Sciences at the Australian National University honoured him with the establishment of the Robertson Symposia in 1987 and the naming of the Robertson Theatre, opened in 1992. The Australian Society of Plant Physiologists honoured him with a named lecture, commencing in 1996.